Ford Mustang, the iconic American pony car was brought to India through the CBU route and only the GT variant carrying the massive 5.0 L V8 was brought into the country. 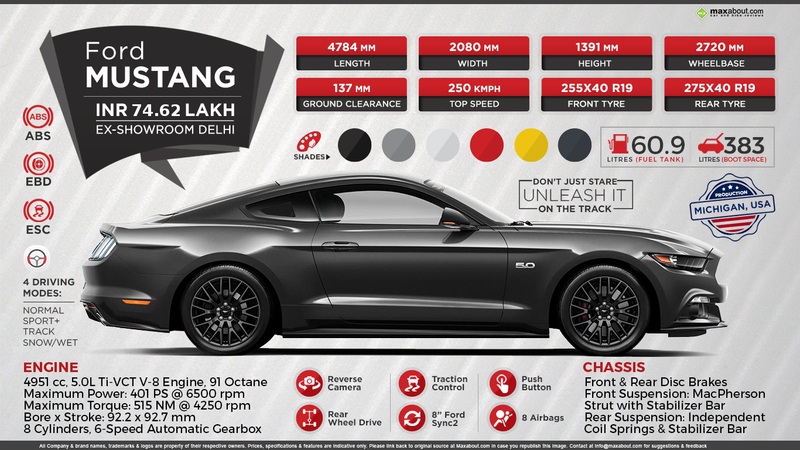 The engine on the Mustang is good for 401 PS at 6500 rpm and 515 Nm at 4250 rpm. It comes mated to a 6-speed automatic gearbox, offering drive modes like Normal, Sport+, Track and Snow/Wet. Paddle shifters on the wheel makes Mustang even more fun as being a rear wheel drive, it is actually much more fun to ride than other cars with front wheel drive layout. It even come with front brake lock option for effective burnouts. Mustang brings equal amounts of safety with its huge amount of power, carrying 8 airbags and traction control for keeping the passengers safe at all times. Click here to know more about Ford Mustang.